AKA Eric Himpton Holder, Jr.
Subject of a politically motivated contempt vote by the US House, over the "Fast and Furious" gun-running sting. Republicans have been upset at Holder since he began targeting voter ID laws passed by the states. He is the first cabinet member to be held in contempt by Congress in US history. The ultimate irony is that the failed program in question, Project Gunrunner, was conceived and begun by the Bush Administration. As early as 2006, this project allowed firearms to fall into the hands of Mexican drug cartels. 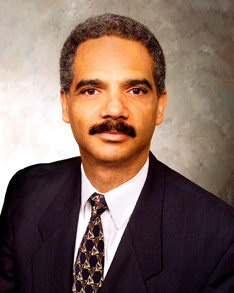 NNDB MAPPER Create a map starting with Eric H. Holder, Jr.